1. 7.25 oz. twill fabric. Provides proper strength to contain overstuffed cushioning material. 2. 1.5 layer of thermal bonded polyester wrap. For a clean finished appearance and long lasting comfort. 3. 9" (4 pieces) of 1.8 high densities, high resilience foam…provides flexibility, conform-ability, and firm comfort. 5. 8 box type construction. A heavy-duty outer shell (that consists of a top, bottom & side panels) that provides a sturdy edge support, strength, and long life. 6. Nylon tufts. Is the strongest ware-resistant tufting material to endure the pressurization process? 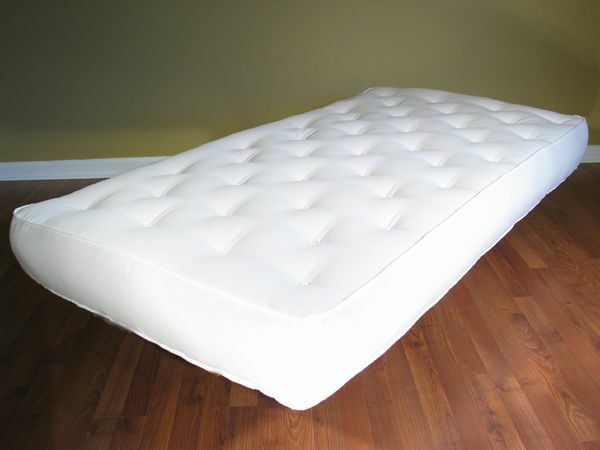 The length and number of tufts installed are also key factors determining the mattresses comfort & durability. 7. Compression Lace Tufting. Pressurizes 13" of overstuffed goods to fit inside a true 8" box corner. The force created when the materials are properly tension-ed to work together form a supportive synergy for comfort and durability. 8. Tape Edge Construction. Seals the comfort inside and tailors the edges for durability.